LIVE TRAINING WORKSHOP: Create an Authentic Personal Brand and Become Irresistible and Unforgettable to Fun & Exciting Clients Who Get and Value You – While Being Totally You! Not all coaching programs are created equal. 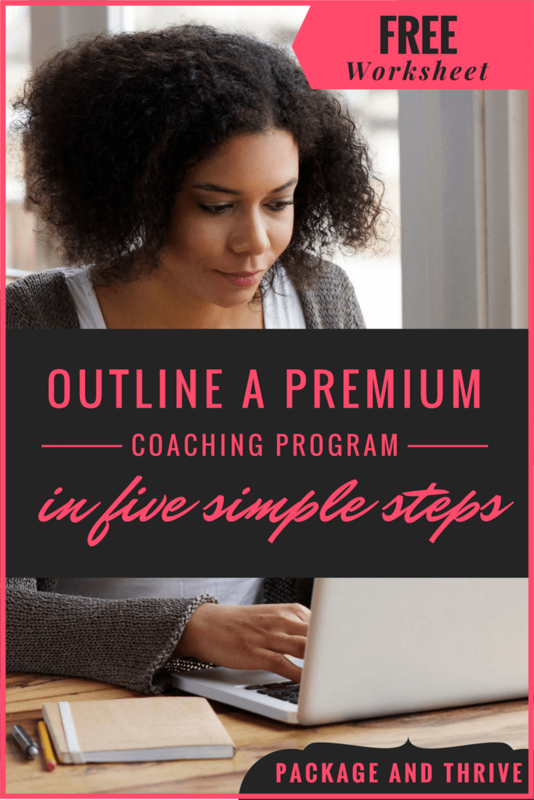 There’s the coaching program that makes the potential client want to enroll right away or tell a friend about it because it would be perfect for her. And even if she doesn’t have the money to invest in it right away, she adds it to her wishlist and figures out how to get it. Because she knows THAT’s what she’s been looking for. It’s the solution she’s been hoping for. She knows that by enrolling for that coaching program or session, that challenge that’s been bugging her will be many more steps closer to over. And that’s what she really wants. Then there’s the other type of coaching offer… It’s unclear, confusing, unappealing and makes the reader wonder why the heck she should invest in it. She clicks away from the offer and immediately forgets about it. Do your coaching programs sell? Are they attracting inspiring and interesting clients who get you, value your expertise and love what you do? Are you excited to offer your coaching programs? I believe that if you’re reading this right now, you’re a coach, consultant, or healer – you help people overcome a certain problem and achieve results that excite them. You thrive and feel most fulfilled when you work with a client and help them achieve those results that had previously seemed impossible to them. So let me ask you a question, how do you package your coaching offers? Have you packaged them in a way that excites the people you’re meant (and love) to serve so much that they can’t help but enroll to work with you? Or do you find yourself having the kind of clients that drain you and make you doubt your calling? If you find that you don’t seem to be attracting the kind of clients that are excited about your coaching services and that truly value and appreciate your support, then maybe you should look at how you’ve packaged or presented your coaching offers. You might have packaged your offers in a way that does not make it very clear to the people you’re meant to serve exactly how you can help them. Maybe the coaching packages don’t make it clear that you’re THEIR PERSON – the one they’ve been looking for to help them solve THAT PROBLEM that’s been keeping them awake for a while now. Most coaches have been taught the WRONG way of creating their coaching offers. 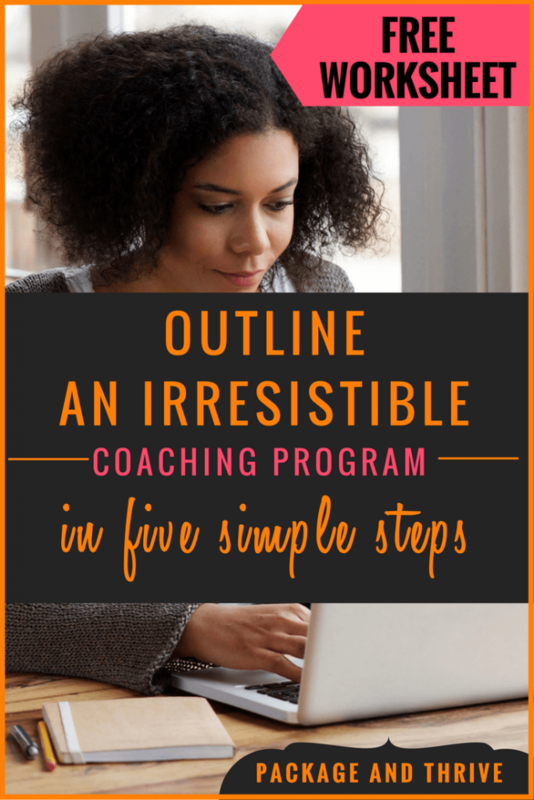 In this post, I’ll guide you through a process that will help you create an outline for coaching programs that are more attractive to your ideal clients. If you follow this process, you’ll create programs that will make it very clear who you help and how you help them. It will be very easy for those people you truly want to serve to say “Yes!” to your coaching programs. To help you follow along in the lesson, I’ve created a step-by-step worksheet for you to fill out. I’ve also created a PDF version of this blog post, which you can download, print, and refer to as you follow along. You can get both the worksheet and the downloadable lesson by clicking on the button below. I’ll never share your contacts with anyone. This might sound like a silly question to you, but I promise you it really helps you as you work on developing your coaching program. To start off, you could answer this question by stating your “job title”. Answering that first question is a first step, but it’s not enough when it comes to truly understanding yourself. You need to go further – a little deeper – to help you fully express yourself. What lights you up? What are you good at? What do you enjoy doing so much that it feels like you’re playing? In other words, what’s your expertise? You might think that this is the same as the first question, but it’s not. Not really. The first question was much more about “job title” and the second question is more about the results or outcomes you help people achieve. For example, maybe you’re a nutritionist that also loves cooking. Perhaps you’ve come from a long line of chefs? Or maybe you just love creating meals that are tasty, fun, and nutritious. In this case, you could say that you’re in the business of helping people live healthy lives by having tasty, nutritious meals. Tapping into the things you already love doing – your passions & talents – can be a major key to creating coaching programs that bring out the best in you and attract the best clients to your business. Your turn: In the worksheet, fill out the questions related to Step 1. The aim of this step is to have you identify a target group of people that you would like to serve through your program. These are people that want this problem solved NOW. You’re really not alone. This step makes many coaches balk and freeze. One of the most difficult things a coach can be asked to do is to CHOOSE who to work with. After all, in your opinion, EVERYONE needs your services. You’ve started a BUSINESS. Not a hobby or a charity organization. And as much as you’d like to help everyone, you also need to make decisions that are more supportive of your success rather than failure. The quickest way to become successful in your coaching business is to specialize – not generalize. In other words, be perceived as the go-to expert by a select group of people, and help them in one way. Once you’ve become successful with that group of people, you can then either offer them additional services, or expand the group of people you help (get a bigger pond). It may appear counter-intuitive, but it’s the best approach to quickly becoming successful in your coaching business. Let’s say there’s a couple that’s been trying to get a baby for many years without success, and they’re looking for help, which one do you think they will choose? The professional who works with couples that have been experiencing challenges getting pregnant? My point is, even if you got certified as a ‘general health coach’ or ‘life coach’, I would encourage you to think about which group of people you resonate most with. FOCUS. So choose a group that has a problem you feel you can help them solve and that would be willing to invest in having whatever problem they’re experiencing solved. And don’t worry or think too much about it. You can always change the group later on – it’s not cast on stone. And it doesn’t mean that you can’t serve people who don’t belong to that specific group if you want. So how do you choose this group to focus on? As you’ll see in the worksheet, your knowledge, interests, life experiences, passions, and talents can be a good place to start. Whatever you decide, choosing a group that excites you will be a good idea. You really don’t want to choose a group that bores you to tears. You need to choose a group that makes you feel excited about serving your clients. Otherwise, you’ll do everything you can to sabotage your business so you don’t have to spend your time with these clients that don’t light your fire. Let’s go back to the nutritionist who’s in the business of helping people live healthy lives by having tasty, nutritious meals. It’s true, she can serve anyone. Everyone needs to have tasty, nutritious meals. But we want to make her double or triple attractive. So we’ll help her choose a group to serve – to start with. She can always widen the scope later on. Our nutritionist happens to have a daughter who, unfortunately, was diagnosed with celiac disease. So she’s been spending many hours coming up with the type of meals that will ensure that her daughter lives a healthy life. Tasty meals suitable for a person living with celiac disease. Right there, that’s a BIG clue to what group she can focus on – people living with celiac disease. If she wanted, she could even micro-specialize and focus on children living with celiac disease (but I don’t think that’s really necessary). The thing is, we could assume that she is passionate about working with this group of people because of her life experience. Now go ahead and choose your specific group. Your turn: In the worksheet, fill out the questions related to Step 2. In this step, you’ll get very clear on your potential clients’ needs and desires. Usually, if you’ve faithfully gone through Steps 1 & 2, this step is easy. The basic idea here is to clearly frame what prompts your potential client to ‘go out’ in search of you and your kind of services. Getting this clear will help you frame your offers using language that your potential clients relate to. When they see this, they’ll immediately know that they’re in the right place and that you’re the right person to help them. How do you get clear on your potential clients’ needs and desires? ☑ What problem is this group experiencing that they need help solving – NOW? ☑ What do they want to get rid of or run away from right now? ☑ What do they dream about or wish for? Complete this statement on behalf of this group: I need to find a way to _________ right now. Write down all the things that come to your mind in relation to your core business and this specific group of people. You might come up with one thing or many things. Just brainstorm – allow your mind to freely come up with ideas. Don’t restrict yourself. If you get this clear, it will be very easy for you to create coaching offers from your client’s perspective. And this will be very attractive. Your turn: Complete the questions related to Step 3 in your worksheet. If you want to be successful in your coaching business, you should offer coaching programs that are focused on helping your clients solve a problem or achieve a result they really want. 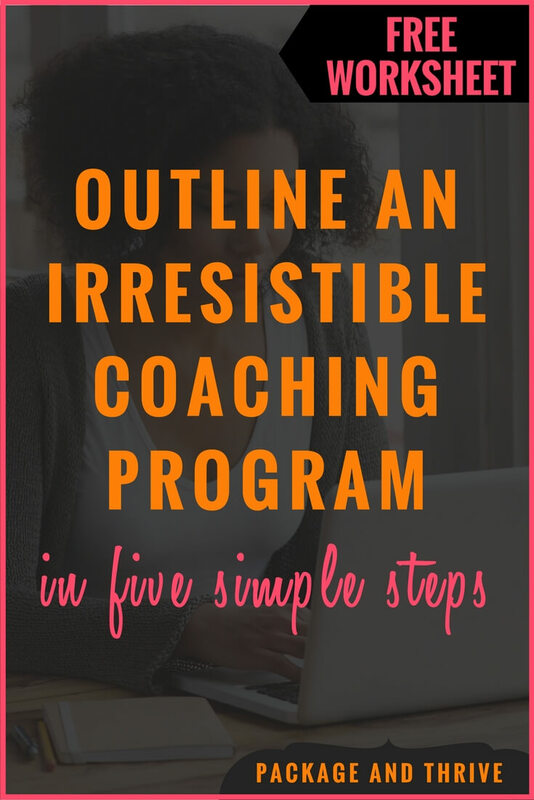 Now that you understand your potential client and what keeps her up at night, you can use your knowledge and passion to create a coaching offer that will be irresistible to them. You can create as many offers as you like, and they can take any form you like. For instance, you can create a long-term coaching program or a shorter, intensive coaching program, or both. Whichever you choose, the process of creating it will be more or less the same. However, the shorter, intensive coaching program can only focus on a small, very specific problem that can be solved within a very short time (usually within one day or less). To begin the process, you need to decide on which of the problems you identified you want to focus on. Remember, your clients go out in search of solutions to specific problems. So you need to create a coaching program that is focused on solving a specific problem and achieving a clear result. So, as the questions for Step 5 in the template require, which of the problems you identified your potential clients have do you want to solve through your coaching program? What result will your clients achieve as a result of going through your coaching program? Going back to our nutritionist, we see that this group seems to have a number of desires. But our nutritionist has decided to focus on one BIG need or desire for one of her coaching programs: How the heck do I get started on a ‘celiac-friendly’ (gluten-free) lifestyle? SIDENOTE: Some of the things on the nutritionist’s list can easily be part of the same coaching program offered over a longer period, say 3 months. However, she could also decide to have ‘mini-coaching’ programs that address a very specific thing from this list. The ‘mini-coaching programs’ could be an intensive (VIP) coaching session of 1 hour or even half a day or so; a “quick start” kind of program. This type of mini-coaching program helps the clients achieve results FAST. And they also give the clients an opportunity to ‘sample’ her coaching. The mini-coaching programs can also be a part of the bigger coaching programs. In the nutritionist’s case, after looking at the list of issues, she’s decided that she will also have a 1-week coaching program to guide mothers towards helping to heal their children’s guts and help them return to normal as soon as possible. From her own experience, and from her research, she knows that this is a common need for many parents. The important thing is that this intensive coaching program would be focused on solving a very specific problem. It would not just be a “let’s chat for 30 minutes and see where it goes” kind of session. Okay! So far, you’ve identified a group to serve, the problems that they need to be solved, and the problem you want to help them solve through your coaching program. This is great! Now, you need to give your coaching program some structure. Since you’re an expert at what you do, this should not be a very difficult step. Essentially, you need to brainstorm on what your client needs to do, know, feel, and think in order to move from the problem to the solution or desired result. Initially, I suggest that you simply brainstorm any and all things that come to your mind – don’t try to organize the steps yet. Just do a brain dump. Once you’ve finished brainstorming, you can now organize the steps logically, from the first to the last step. Here’s a key tip: each step in your coaching program should help your client achieve a mini-result that takes her closer to achieving the BIG result. For each step, make sure that you identify any tools, tips, or strategies that can make it easier for your client to go through the step and achieve the desired result. Now that you’ve outlined your coaching program, you need to tie the pieces together – determine the lessons for each step, choose the handouts, and make sure you’ve identified good tasks for each step of the way. You’re now (almost) ready to offer your coaching program! Of course, there are other things you need to decide and do. For instance, you need to create the actual content for each lesson and module, you need to price your offer, you need to create a sales page, set up your payment processor, set up your booking or scheduling system, among others. However, if you’ve completed the five steps above, you’ve achieved a BIG result. Got any comments, questions or suggestions? Use the comments section below. Or you can get in touch with me via my contact page. I’d love to hear from you!